Please call owner Robert at 516-546-4678. For Sale 1996 370 Sea Ray Sedan Bridge Powered by twin gas Mercruiser 7.4 MPI (340 HP)- both fresh water cooled motors have under 700 hours. This Sedan Bridge was refreshed on the inside, and has a 12’4” beam and 2’7” draft along with a low hour 7KW Westerbeke Generator (less than 240 hours). This boat comes with Radar, autopilot, a new GPS chart plotter (2017), and Standard Horizon DSC radio (2017). This South shore Sea Ray is ready to cruise and comes with Bay strainers on both motors. Inside accommodations include both a master and guest staterooms, each with its own door for privacy. 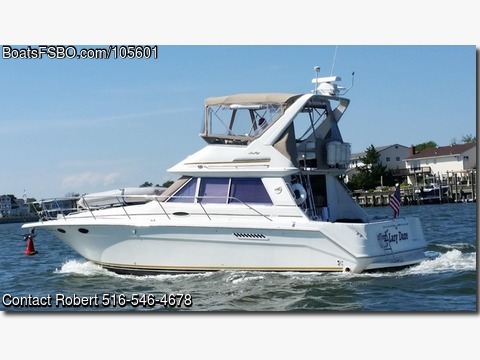 The amount of room and comfort inside this 37foot SR is unmatched by similar sized boats. This Sedan Bridge has a 70 gallon fresh water tank, as well as a dockside water connection along with a6 gallon water heater and a Sealand vacuflush head with 20 gallon holding tank. When docked, the boat has 2- 30 amp service ports for power. Dinghy with 2.3 Honda 4 Stroke included. NAVIGATION & ELECTRONIC EQUIPMENT: VHF Radio: Standard Horizon 1700B with DSC built in GPS: Standard Horizon Chartplotter CPN 700i Compass: Ritchie 5"Magnetic Radar: Ray Marine R41 Depthsounder: B & G digital Speed/Knot meter: in GPS CO. detector in cabin, Auto Pilot: -- Other: Analog Engine Synchronizer.